Plastic, double threaded for easy mounting. Used to hook up personal shower to exposed diverter. Quick, easy access to plumbing, electrical, telephone, sprinklers, etc. and lowers the cost of future repairs. Easy to install: just measure, cut, then pop in the panel. Patented, spring-loaded mechanism permits frameless mounting from the outside. 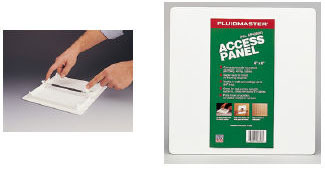 High-impact, non-yellowing polystyrene panel is backed by one-year warranty. No screws, latches, fasteners or framework needed. Lightly textured surface accepts wallpaper or paint. Made of 1/8" mirror acrylic, matches all bathrooms. Conceals damaged tile and walls. Easy installation, no special tools required. 14" x 6". 48" braided, reinforced blue tint universal replacement hose with thumb lever spray head. With universal adapter. 15/16" Male by 55/64" Female. 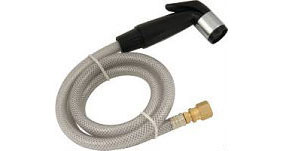 Adapts most faucet brands to accept garden hose thread. Adapts faucet thread to garden hose thread.